Willow Tree Preschool has two teachers on staff—Kimberly Palmer, and Annemarie Neuman. Our consulting art specialist, Elizabeth Craig, yoga teacher, Catherine Dart, and music teach, Zoe Chamberlin come weekly, rotating days to ensure that all children have frequent access to their unique talents and perspective. Kimberly Palmer has been an early childhood educator since 1989 and has a background in early-childhood education, art, and psychology. In 2005, after many years teaching at other schools and seven years co-owning and teaching at another program, Kim was inspired to open Willow Tree Preschool. Her goal was to provide a small, warm, intimate, and nurturing environment for children. She continues to learn and finds inspiration in various philosophies and teaching practices, especially the progressive early-childhood programs of Reggio Emilia, Italy, but her biggest inspiration has always been the children. She finds joy in each day with the kids and is honored to be a part of their unique paths of learning and exploration. As well as her passion for teaching, Kim has a dance background and shares her love of dance with the children, using rhythm and dance in the classroom frequently. She strives to have a classroom that is alive, always growing and changing to reflect the children and teachers who work and play there. The birth of Kim’s daughter in 2009 and her son in 2013 have been her greatest teachers yet. Introducing yoga to children at a young age is a gift to them. Not only do they build a strong and flexible physical foundation, but more importantly, upon that foundation, the child begins to know and develop a sense of self and build upon their feeling of centeredness and self worth. Catherine Dart started teaching yoga in New York and has been teaching since 2000. She joins us at Willow Tree every week, teaching us yoga for children in her fun, dynamic style. Elizabeth Craig is an accomplished ceramic and mixed media artist who has worked with children and adults for over 25 years. Elizabeth’s background includes in depth study of the pedagogy of the early childhood schools of Reggio Emilia, Italy. Additionally, she was a founding member of the Opal Charter School Development Team, which shares the mission of the Portland Children’s Museum. As a consulting art teacher, Elizabeth supports the children’s natural curiosity and development through an effortless process of inquiry and reflection that deepens a meaningful exploration of the arts. Her passion for play, whimsy, and the combining of mixed media provided limitless inspiration for both the children and teachers at Willow Tree Preschool. Her private studio, Art in Motion, offers classes for both children and adults. 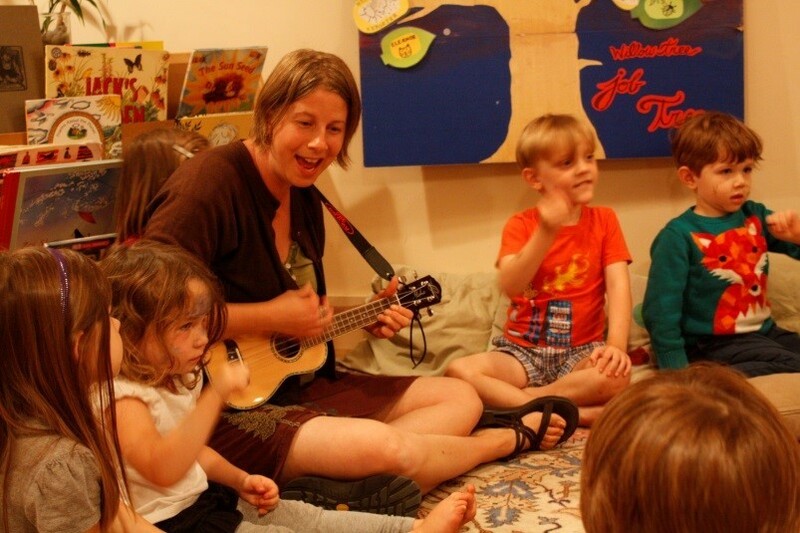 Zoe has been teaching music to kids of various ages on and off since 2002. Her music-teaching career kicked off with teaching hand drumming classes to groups of teenage girls at a residential treatment center, which ignited her passion for music facilitation. From 2005 to 2008, Zoe worked at Willow Tree Preschool as a full-time teacher and in-house musician, often playing her revered jumbo guitar, Big Bertha. Although the students were a lot smaller than teenagers, their enthusiasm and appreciation for music was not. Now, several years later, Zoe is thrilled to once again be part of the amazing Willow Tree community. During a typical music session, kids participate by playing/using their voices, bodies, rhythm sticks, shaker eggs, percussion instruments, bells, gathering and small hand drums, play scarves, a parachute, and whatever other cool objects Zoe happens to get her hands on. You can find out more about Zoe at zazzyzoe.com.